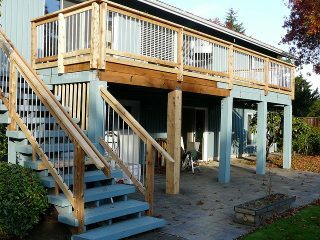 Is your deck in true need of repairs or replacement? From the natural elements to high traffic, it’s expected for the material used to experience some wear and tear over the years. No matter what you ​need, whether it be fixing sagging planks or under the deck repairs, our contractors can help get your outdoor area back to a beautiful state. 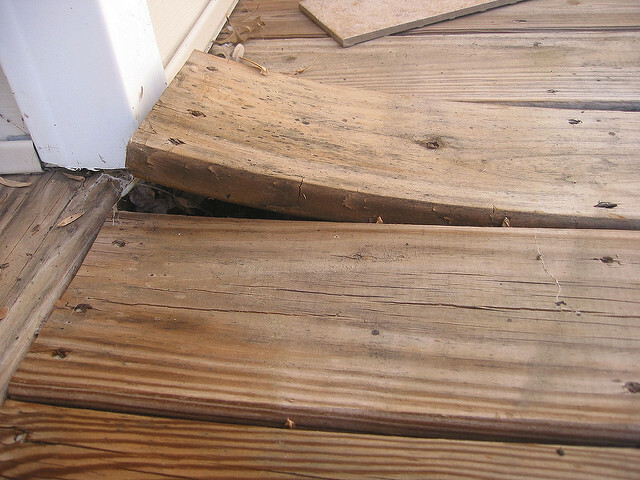 Repair of Damaged Deck Boards: Deck boards often get damaged from weather, improper use, or high traffic. No matter the cause, we have the solution. Our workers will get out to your property and repair any boards that are damaged and may compromise the integrity of the surface. No area of damage is too small—even tiny issues can quickly escalate. We’re happy to come out for any size job and repair what’s necessary to give full use and safety back to you and your family. Replace Rotten Decking: One of the biggest downsides to using natural materials outside is that it inevitably will begin to rot, and that weakens its strength and its ability to hold up people, furniture, and pets. Any sign of rot, whether big or small, should be dealt with upon observation. The best time to replace rot is as soon as possible. A good way to know if you might have rotting damage is to check the areas that naturally attract water pooling whether from snow or rain. When checking for rot, simply press down on an area you may think is in trouble. If the area has any give with any sort of pressure, you’re better off having our contractors come out to replace the rotted areas. Repair Stairs: Stairs are a crucial part of the safety on a raised surface. A set of stairs that is wobbly, water damaged, or weakened due to wear and tear over the years should not be walked on. But don’t worry—our trained professionals will come on-site and identify any weak points in the material. We will replace what is compromised and ensure the new set of stairs is safe and secure before leaving the property. Repair of Sagging or Pulled Planks: It’s very common to have beams running the opposite way as the floor planks that serve as support underneath. Essentially, the whole floor is then being supported by these beams. Over time, the constant weight on these beams may cause them to sag downward from the pressure of gravity. They also may pull away from the center as water and wind warp them. This is a dangerous sign for an outdoor seating area. Any pulled or sagging planks compromise the strength of the original surface. We’re happy to take a look underneath and repair any planks that might be putting you at risk.